There are many different jobs in the medical profession and some of which have very confusing career titles. Certified Nursing Assistant also referred to as CNA and Medical Assistant are two of such careers. While these two medical professionals have some similar roles, they are somewhat different in various ways, contrary to what many people think. Read on for a full comparison of these two medical professions. A medical assistant works in medical centres, clinics or offices of doctors completing various administrative and clinical tasks. Medical aide’s duties vary from one workplace to another depending on such factors as the size, location as well as the speciality of the medical facility in which they work. Often, they perform clinical, clerical or administrative duties, or all three. Their administrative duties include scheduling medical tests, updating patient files, and arranging hospital admissions. Although they’re cross-trained to do a range of front-office and back-office tasks, medical assistants can specialize in either clinical or administrative work especially when working in larger care facilities. Medical assistant training involves completion of an accredited post-secondary medical assisting program which takes 1-2 years. Programs are often offered in technical schools, community colleges, and universities and involve both hands-on care experience and bookwork. Who is a Certified Nursing Assistant? As their title suggests, CNAs (also commonly referred to as nursing aides) assist nurses in providing care for patients in various ways. Their roles are more specified than those of MAs. Generally, they have more of caregiver roles which may include bathing patients, repositioning or moving patients, and feeding them. In residential care facilities and nursing homes, nursing assistants usually act as the primary caregivers. – Measuring and recording food intake, among other duties. Certified Nursing Assistants play a critical role in the comfort of the patients in care facilities, particularly in long-term care facilities like nursing homes. They spend a lot of time with patients; therefore, their relationship with patients is very important. CNA training programs often last for 6 weeks to a couple of months. The state-approved programs are offered in high schools, technical and vocational schools, community colleges, hospitals, and nursing homes. Students learn basic nursing principles including direct patient care, safety, and documentation. They also have to successfully complete thoroughly supervised clinical work. • A Certified Nursing Assistant has more clinical duties, providing bedside care while Medical Assistant duties include more demonstrative and procedural work. • MAs work under the office manager or physicians while a Certified Nursing Assistant reports to Registered Nurses or Licensed Practical Nurses. • Mostly, medical assistants have more training in managing medical facilities, front offices. This is not the case for CNAs. • A Certified Nursing Assistant receives more training than a medical assistant. For this reason, CNAs become more involved in most of their job’s clinical aspects. Again, because of their training, they can easily advance to a higher degree. • While MAs generally get phlebotomy training so they can become more marketable, Certified Nursing Assistants do not. • Medical assistants often have more duties and responsibilities than Certified Nursing Assistants. What is Common Between a CNA and a Medical Assistant? Both professionals work with patients and collaborate with physicians and nurses in medical settings. Since they both work with the public (patients), they are required to act professionally at all times. Again, while medical assistants have clerical and administrative responsibilities, both professionals have a range of clinical duties. 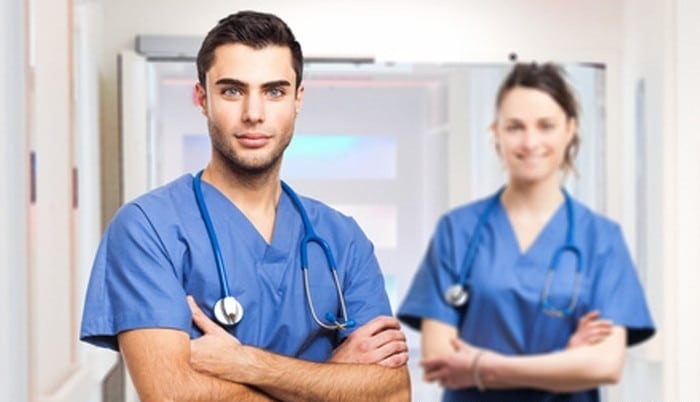 While requirements for licensure may slightly vary from state to state, MAs and CNAs are usually subject to similar healthcare regulations as outlined by such agencies as the JCAHO (Joint Commission on Accreditation of Healthcare Organizations) and OSHA (Occupational Safety and Health Administration). Where Do Medical Assistants and CNAs work? Various medical facilities like public hospitals, private clinics as well as doctors’ offices usually hire medical assistants, CNAs, or both. However, because CNAs are more suited to caregiver responsibilities, they often easily find employment in nursing care facilities like nursing homes or assisted living centres. A Certified Nursing Assistant who wants to specialize and, say, become a nurse may work in a specific department in a hospital. For instance, working in the obstetrics department may offer excellent on-the-job training and hands-on experience to become a midwife. CNAs and MAs can also work in private and public outpatient clinics that specialize in particular healthcare such as ambulatory surgery or reproductive health. Such clinics provide great opportunities for both medical assistants and CNAs to gain experience in specific fields, which may then be helpful when trying to specialize and upgrade. It is, however, important to mention that each care facility is unique, which means MAs and CNAs may find employment to perform specific duties. According to data from the U.S Bureau of Labor Statistics, as of May 30th, 2018, the median annual salary for a Certified Nursing Assistant is $31,692. The annual CNA salary ranges from $28,721 to $35,260. This, however, depends on a variety of factors including the state and city in which the CAN works. The median Medical Assistant salary was $34,114 as of the same date, with the range being between $31,446 and $36,837. Again, the annual salary depends on various factors. Copyright © 2019 About CNA. All rights reserved.